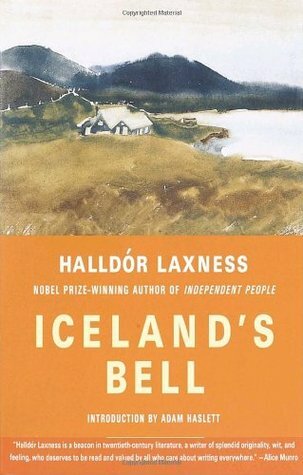 Sometimes grim, sometimes uproarious, and always captivating, Iceland’s Bell by Nobel Laureate Halldór Laxness is at once an updating of the traditional Icelandic saga and a caustic social satire. At the close of the 17th century, Iceland is an oppressed Danish colony, suffering under extreme poverty, famine, and plague. A farmer and accused cord-thief named Jon Hreggvidsson makes a bawdy joke about the Danish king and soon after finds himself a fugitive charged with the murder of the king’s hangman. Another wonderful novel by Halldór Laxness, who is fast becoming one of my favourite modern authors. Iceland's Bell feels in some ways like an Old Norse saga, yet it is written in a clearly modern style with superb use of wry, witty humour and hints of parody. In many ways it is a dark tale, but thanks to Laxness' skilful prose, it never feels gloomy. All the characters are beautifully rounded. Each has faults, yet they all the more likable because of them. There is a wonderful sense of both period and place, and the story and its players held my interest from start to finish. I have one more Laxness novel in already in my tbr pile, and I will certainly seek out more after that.